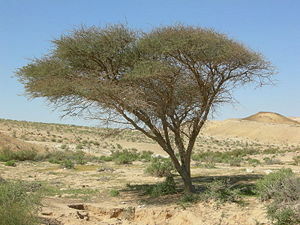 Acacia wood is a kind of tree found in the Middle East and other places. It was a poplar building and construction material in Biblical times. Both the Ark of the Old Covenant and Noah's Ark were made wholly or partly out of acacia wood. Despite its Biblical origins, the acacia tree is sometimes associated with unsavory connotations. It is used as a symbol in Freemasonry, and its bark can be used to produce hallucinogenic drugs such as DMT and PCP. This page was last modified on 27 June 2016, at 21:42.